Luton Town, under Buckle are a side transformed, with a 2-0 victory at runaway champions Fleetwood evidence that the late gamble has paid off. A midweek 0-0 at Gateshead and last weeks winner takes all 1-0 win over Kidderminster suggests they are hitting a peak just in time to tackle Wrexham over two legs. Third placed Mansfield, who take on York City are arguably the form side with another impressive 3-0 win over ten man Kidderminster. A red for Vaughan on 48 mins saw the Harriers dreams fade and die in front of the faithful as the visitors ran riot with goals from Stevenson (56), Briscoe (78) and Green 87. The Stags beat Wrexham 2-0 last week to boot, so the 1100 (800 terrace 300 seating) will be confident against a York defence that can peel an orange in its pocket. Buckle officially took over on April 8th, with Luton’s play-off dreams under threat after back to back defeats at Braintree 3-1 – the day before – and a 1-2 home reverse to York the previous Monday. His first game a 4-2 home win over Hayes brought to an end a horrific run of no wins, two draws and four defeats in six games. The last six in comparison have seen four wins, two draws and no defeats with ten goals for and just two against. The last five games have all seen clean sheets. Wrexham travel to Luton on Thursday for the first leg in good spirits. The Dragons’ 5-1 slaying of Braintree on Saturday saw 750 of their 1500 allocation snapped up by Sunday evening and, with tickets on general sale today to non-season ticket holders, the away end looks set to be packed on Thursday 3rd May. Wrexham also beat rivals Newport 0-1 away last Tuesday, but tasted defeat at another form side – the scoring Stags 2-0. Prior to that saw a 2-2 against Grimsby and a 1-1 top of the table TV date against Fleetwood. York finished the regular season with a 1-0 win over Forest Green, their third 1-0 on the trot (Braintree & Cambridge). Newport did get a goal against them in a 1-1 draw but prior to that saw a 2-0 win at Alfreton. Fleetwood did storm the house of York once, the week before, to record Yorks only defeat in their last six outings. Confidence will be high that they will be able to contain the rampant Stags attack on Wednesday at least. With the relegation places sorted all attention moved to the top of the table with Luton and Kidderminster still contesting the final play-off spot. The Hatters 2-0 win at Fleetwood made the Harriers home game against Mansfield academic, but the 48th minute red for Vaughan turned the game. To rub salt into the home fans wounds, Stevenson, Briscoe and Green left the Harriers well and truly grounded. York recorded their third 1-0 on the trot to clinch fourth spot and a double header with Mansfield. The first instalment is on Wednesday, an interesting test and a clash of two cultures that will see the rampant Stags take on the mean defence of York. The BSP basement sides by and large bowed out with defeats, although with Darlo playing Kettering something had give or be gained. Bath lost 2-1 at Alfreton, Hayes lost 1-2 at home against Stockport in front of 654 fans – at least twice the norm. Kettering lost 1-3 at Darlo who were the only side in the bottom four to win. Just 1792 graced the 30,000 arena but at least it saw a win on its way to almost certain oblivion. With just five players under contract beyond this season David Holdsworth has the opportunity of a revamp that few of his predecessors have enjoyed. That said this is an era of austerity and the lure of 44 week contracts in a football market that steadfastly refuses to take economic reality on board suggests the cream will not come running. Then again the ambitious Alan Power’s and Joe Anyon’s of this world will depart for more lucrative contracts. Nutter, Gowling, Taylor and Perry all signed two year deals and will be under contract until June 30th 2013, lucky for some. Conal Platt signed an 18 month deal in January that will also expire on June 30th 2013. All the other players will be leaving between next week, particularly if the prudent Holdsworth has signed them and June 30th (with an extra months pay to boot) if they are on the traditional one year deal. Any new deals will be signed with the 44 week non-league deal as the norm. Even those who are retained will either have to get a job or sign on prior to returning for pre-season training on July 1st. Certainly on-loan Williams and Thompson have put spine in the team and Jefferson Louis also has a strong case but should all 3 stay, along with the fab 5, that would mean taking up almost half the places in an 18 man squad for next season. That is without taking into account what the 5 will take of the budget given the amount they are paid and the 52 week nature to their deals. From the list below it is therefore as much a question of who Holdsworth wants to keep as well as how many will use their savings to prove their loyalty to him. Although few clubs however will want someone on the wage bill until July 1st a better deal will entice a bank manager to facilitate an overdraft or a bridging loan. Are Bob, Reg & Trust Equal To The Trinity Threat? 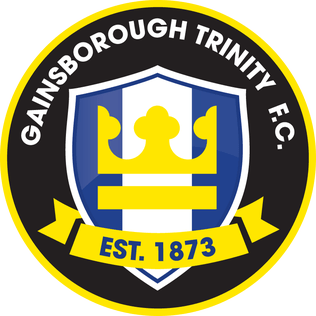 In 1912 Gainsborough Trinity were voted out of the Football League, replaced by of all teams their local rivals Lincoln City. Lack of fan base and financial backing rather than relegation led to the demise, but now both these factors appear a thing of the past. Ominously for the complacent Imps, the two ancient rivals appear on the verge of meeting next season thanks to ex Imp Leon Mettam’s hat trick in the 3-2 win at Altrincham yesterday. When Steff Wright was still in charge and justifying that it was not for the directors to put their hands in their pockets when a club should be able to sustain itself on budgets alone; the loudest voices were in agreement. Those against, labelled ‘the malcontents’ looked northward as Peter Swann of the Wilkinson family began to put his money where his mouth was. Brian Little certainly squandered a lot of money, Swann was also ridiculed over his plans for a new ground, yet he kept the faith and continued to plough in the cash. Little was not the complete waste of time many were quick to point out, passing on valuable contacts to understudy and now manager Steve Housham, to go with his contacts and experience gained under Brian Laws at Scunthorpe. Housham has moulded a decent side with the spirit to match Swann’s spondoolies, leaving plenty in the bank for next year. Kevin Sandwith, Adam Watts, Dominic Roma, Shane Clarke, Michael Leary, Jamie Yates, Paul Connor, Leon Mettam and Darryn Stamp are part of a squad that has shed the prima donnas whilst retaining the quality and passion for the cause. With so many ex-Imps in the side it is no surprise to see several Imps starting to take notice of what is going on up the road. The migration is just a ripple at the moment as Trinity’s growing crowds will attest, but the DN21 spring could yet become a river should they beat FC Halifax this Wednesday (KO at Northolme 7.45 – £10 for adults, £6 for oap’s, £2 for 12-16 and £1 for under 11’s) and then Guiseley or Nuneaton in the playoffs. Football is an entertainment business with success and ambition an undeniable magnet to many local fans – die hards apart. As is the cost of going to a game for a country and county gripped by recession. Gainsborough charge £10 for adults, £6 for oap’s, £2 for 12-16 and £1 for under 11’s. Although the prices will undoubtedly go up next year, Peter Swann, a local man on a mission looks happy to subsidise in a town set to grow to 40,000 in the next few years. He will also unveil a 4,000 community based stadium shortly. Three years ago we were three divisions apart, next year we could be contesting our first competitive games since 1996, then an FA Cup tie that went to a replay. Both games, a 1-1 draw and 3-2 win for the Imps were played at Sincil Bank, due to police advice, but you cannot help thinking that the two old rivals may not stay on a par for too long. Swann has the money and ambition for his club, whilst the Imps appear happy to tread water – in football terms a road to nowhere. What are the 2,000 fans who saw us in 2009 currently doing every other Saturday? Spincil Bank is championing complacency at a time of wavering support at season ticket renewall time. The manager heralds 17th in the BSP, just 8 points from relegation, as a wonderful achievement. The new Boardroom blog announces its long overdue self to Impdom with long serving supporter director David Beck’s only input being cheaper coach seats for Ebbsfleet. Jean Foster, the long serving Gold Member director has a plan for a five figure fundraiser prior to her resignation in June. Small change for Peter Swann who paid for 150 Trinity fans to go to Altrincham. Whilst Lincoln continue with the smoke and mirrors the Trinity are coming up on the rails. Whether they catch us this season or next, our oldest rivals are most certainly on the up, whilst the committee nature Chris Sutton referred to or Cabal as Chris Travers puts it, is continuing to sideline the mighty Imps. It might not be deliberate strangulation but it is small time mentality, you can smell it, you can see it and few want to pay up front to witness it again next season. And these fans will doubtless want to see some football somewhere next season. No doubt to head off simmering fan discontent over the position of legend, local hero and all round good egg, Grant Brown it is now reported on redimps.co.uk that contract talks are underway with the Head of Youth. Word had been getting around the everyone’s favourite hoofer might be on the slippery slope with manager David Holdsworth holding a smoking gun. One of the few success stories this season, the rumour mill was at full tilt with allegations that the manager might not like being unfavourably compared to the man who led his squad to the Midland Youth Cup but the club is at pains to explain the move is with the manager’s approval. As in his playing days, no one messes with “hoof” Grant Brown. Suppose we’d better talk about football and today brings down the curtain on one of the most disappointing seasons most of us can remember although things could of course have been a whole lot worse. Who could forget the empty feeling we all had at tea-time on the last day of the season last year as the realisation sunk in that we were no longer a league team. Ebbsfleet are the opposition and City will be buoyed by a good contingent of Imps as the club report a strong take up of subsidised travel from the Red Imps Travel section, subsidised by the club that is. I have to pay tribute to those fans who have continued to support the team on the road week in week out, it’s you the team should particularly have in mind as they collect their wages. Hopefully they will manage to put on a show that will send those fans and of course the rest of us into the summer in positive mood. Ebbsfleet stand four league places above City but did you know they were top of the league for having the worst toilets in football in a poll of fans carried out byPlumbCenter? Ebbsfleet weren’t at all inconvenienced by the award in fact they were quite relieved as the award came complete with a prize of £100000 to upgrade their facilities. Let’s hope that by the time the season ends later it won’t be the Imps reputation going down the pan. One last chance then to put some kind of gloss on a season to forget. It would be nice if the Imps took it. Go on, surprise us. A 3-2 victory over Ebbsfleet to finish. On 15 Taylor fired us into the lead with a snap-shot from the edge of the box that took a deflection off right-back Howe for an OG. On 24 Willock struck s penalty home with panache. The Imps made it 2-1 on 27 minutes when Louis beat three and crossed for Bore to tap home at the far post. Taylor then made it 3 on 33 with a fine drive from a dozen yards, starting and finishing a fine move himself. On 65 Shakes did Nutter and played in Bellamy who duly despatched a rasping half volley just inside the right-hand post. Substitutions 84 D/S Pinney on for West & Phipp on for Barrett. The Fleet Willock 24, Bellamy 66. The Imps beat the Fleet 3-2, although Ebbsfleet United can take pride from a performance against an ex-League side whilst they themselves have enjoyed their debut BSP ride. But to the Game footy fans to the game………. Ebbsfleet were at us from the off like a knife through butter. A Willock and Shakes one-two fooled Nutter and Gowling but Willock wastefully drilled wide. Louis and Thompson were certainly getting stuck in attempting to get us a foothold in the game against a big Fleet side. The Imps got a second piece of luck when Gowling lost his footing and dragged Enver-Marum to the ground. Anyon made a good save from an optimistic drive from Shakes. Dominance is one thing goals another, as Taylor fired us into the lead on 15 minutes with a snap-shot from the edge of the box that was deflected just inside the post by right-back Howe. Gowling was lucky not to see a card for a foul on Willock, but Enver-Marum sent the dinked free-kick wide. On 24 minutes Robson tugged West who looked set to roast him for the umpteenth time at the expense of a penalty. Willock struck the penalty home with panache. The Imps quickly made it 2-1 three minutes later (27 mins). Louis beat three and crossed for Bore to tap home at the far post. There looked to be goals in this one with attack the best form of defence for both sides and no mistake. Taylor then beat his man and fizzed one over that just begged for an Imp to be far enough forward to get a head or boot on. Taylor then made it 3 on 33 with a fine drive from a dozen yards, starting and finishing a fine move himself. Gowling saw a towering header saved from a Power free-kick and turned defence into attack with Ebbsfleet tearing up the other end only for Miller to pick Willock’s pocket to avert the danger. Taylor was causing mayhem and screaming for everything either to feet or over the top as he looked to get beyond his man time and again. Miller played one Howe slipped, but Taylor put a glorious chance for a fourth wide. Ebbsfleet waltzed through us at one end as Anyon palmed away a miss-hit Willock drive to keep it at 3-1. Then the Imps went straight up the other end with Louis unable to finish a breakneck four man one-touch move. Sheridan then played in Taylor, who saw his effort incredibly cleared off the lone to end the half. All had that comforting rose tint to it. The Imps stood 16th at half-time with Stockport 1-1 at Hayes. Newport 1-1 at Barrow and Tamworth also 1-1 against Cambridge. AFC Telford were still fifth bottom with a 0-0 at Gateshead. Ebbsfleet were certainly going to give it a go with Gowling heading clear and Nutter cutting out a move with intelligence and positioning. The Imps countered, Taylor the whirling dervish. He played in Bore who centred for Louis who headed wide. He then turned intelligently to release Louis, but pace alas is not one of Jefferson’s blessings. Gowling did Willock, again on the blind side of a ref who could see know evil in either shirt. Miller meanwhile was having a consummate game on the ground at least. The Imps were stroking it around confidently, whilst Ebbsfleet leaving two at the back at times, gave it everything to try and get back in the game. The wet conditions were making for some tasty sliding challenges, further illustrating the quality and touch we have in Taylor )ours for a season more) when used as a fulcrum in any passing move. Sheridan, a workhorse it has to be said, would love that level of ability and beat two before miscuing wildly. 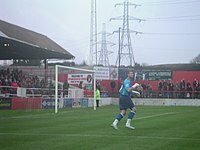 Power was denied by a sensational save from McNeil. On 65 minutes Ebbsfleet were rewarded for their endeavour. Shakes did Nutter who failed to recover, Gowling and Miller gave Bellamy too much time and he duly despatched a rasping half volley just inside the right-hand post. Bore shamefully failed to see Taylor who would have put the game beyond them. We were living dangerously, Gowling and Miller clearly not the central partnership for next season. Willock put wide and everyone missed a West cross that just needed a touch. Taylor got in behind but was denied by a blinding save from McNeil, one on one, with the game on the knife edge. Nutter was done again but top scorer Willock scooped a glorious shot high and wide. Taylor then took a tumble and got nothing allowing the full-back to thump away. On 84 mins a triple substitution no less. For Fleet Pinney replace West and Phipp replaced Barrett, whilst Nicolau replaced Sheridan for the Imps. Although the goal had put the wind in The Fleets sales the Imps were battling hard and taking no prisoners, Miller in particular a rock all game – hampered rather than helped by fowling Gowling making the most of a ref who booked just Howe and Stone. With the Imps effectively operating with 10 men after Robson was left grounded Miller made a magnificent and perfectly timed challenge to rob Willock in on goal after a defence splitting ball from Shakes. Watson then replaced Robson who had taken a heavy knock. With 5 at the back for the Imps it was now a rearguard action and plenty of aerial incoming. One late cross come shot grazed the bar but the Imps just about held out. The Imps finish 17th as Stockport won 2-1 at Hayes, Tamworth drew 2-2 with Cambridge and Newport lost 1-3 at Barrow. Kettering lost by the same score at Darlington as the goals against column reached 100. Before we laugh too heartily they did the double over us despite finishing bottom. Luton beat leaders Fleetwood away 2-0 whilst Kidderminster lost 0-3 at home against Mansfield to make the final play-off spot duel academic. Mind you we don’t want to be worrying to much about that end of the table, let’s look forward to Lincolnshire derby against Gainsborough next season. Impossible? Three years ago yes but the Peter Swann financed side has one foot in the playoffs already – ex-Imp Mettam has just fired them one up at the time of writing with a free-kick. The Imps Travel to Ebbsfleet United, a side who have done well in their first season at the pinnacle of the non-league game. This season has been a tough but successful one for Liam Daish’s side, managing mid table security despite the financial limitations. Their garden of England Geography has seen them go from playing ‘localish’ affairs in the Blue Square South to travelling long distances with a very small squad. Indeed Daish has been short-listed for Conference Manager of the year despite David Holdsworth’s marvellous achievements and recent revelations. Then again this is the real world not the contrived one aka Sincil Spin. Lance has come in from Bristol Rovers on loan and replaced Preston Edwards for the last 10 games( hamstring injury in the last 2 aside). He let in 6 on his debut, conceded 19 goals so far from 10 games with two clean sheets. Could Fan Pressure Save Grant Brown? The Official site have announced that contract talks are under way between Hoof Grant Brown and Roger Bates. With fans morale and season ticket prospects hanging by a thread today’s announcement coincides with a huge outcry from fans on Lincoln City Banter all this week after rumours that he and the Youth set up could face the axe given the football league funding will cease for next season.